Over the past 90 years, Sea Island evolved from a “friendly little hotel” to a world-famous destination, while proving that some traditions are timeless. United States presidents and other dignitaries have visited. Stars and celebrities including James Stewart and Cheryl Tiegs have roamed its hallways, escaping the show business grind to relax among Spanish moss and live oaks, if only for a weekend. Golf’s top competitors and avid fans flock to enjoy its courses and Golf Performance Center, where cutting-edge technology and equipment and insight from industry experts help them enhance their game. And the most powerful world leaders have gathered here, discussing global concerns and shaping tomorrow’s policies. Sea Island, which celebrates its 90th anniversary this year, has enough stories to fill every inch of the isle. Over the years, it has transformed from a “friendly little hotel” into an internationally acclaimed destination—and the only resort in the world to earn four Forbes Five-Star ratings for 10 years in a row. The setting looks very different than it did nine decades ago; however, some things never change. Even while services and amenities are constantly reimagined to meet modern expectations, Sea Island continues to honor its past, retaining its signature elegance and the undeniable sense of community that charms members and guests year after year. In 1910, Howard Coffin and his wife, Matilda, traveled to see his cars race just south of Savannah. They fell in love with the area and inadvertently changed the course of history. If that wasn’t enough, President Calvin Coolidge spent that Christmas in the area with Howard Coffin, and came to The Cloister and planted an oak tree. A photographer captured photos of the event, and the images ran in newspapers across the country. The publicity attracted even more visitors, and the president’s actions started a tradition that would eventually include Dwight Eisenhower, Queen Juliana of the Netherlands, Gerald Ford, Jimmy Carter, George H.W. Bush, Margaret Thatcher, George W. Bush, Tony Blair and Bill Clinton—whose trees can still be seen at Sea Island today. 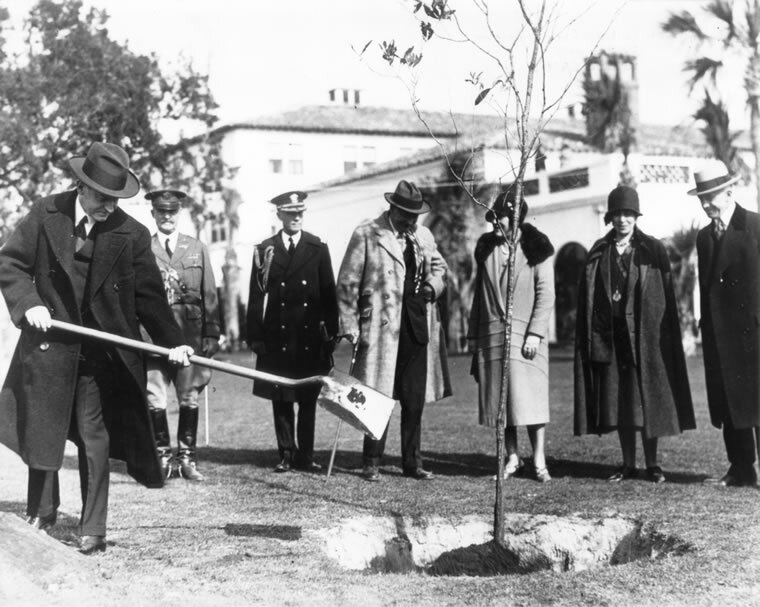 President Calvin Coolidge started a tradition when he planted a commemorative oak in 1928. As The Cloister rose in 1928, Coffin also transformed the old beach club—which once housed a dance pavilion—into a popular seaside destination, with a larger dance hall and freshwater swimming pool. A golf clubhouse opened that September. Things were looking up, but just as the resort began to come into its own, the Great Depression struck. Sea Island hosted the G8 Summit in 2004. Sea Island entered a new era of hosting dignitaries and celebrities, creating unique and memorable experiences for its guests, and gaining more and more notoriety for its high level of service. A new Sea Island Beach Club opened in 1950, and the resort continued to make enhancements to its golf courses, building Sea Island’s reputation as one of the world’s top golf destinations. The Golf Learning Center opened in 1991, followed by The Lodge in 2001, further solidifying that position. 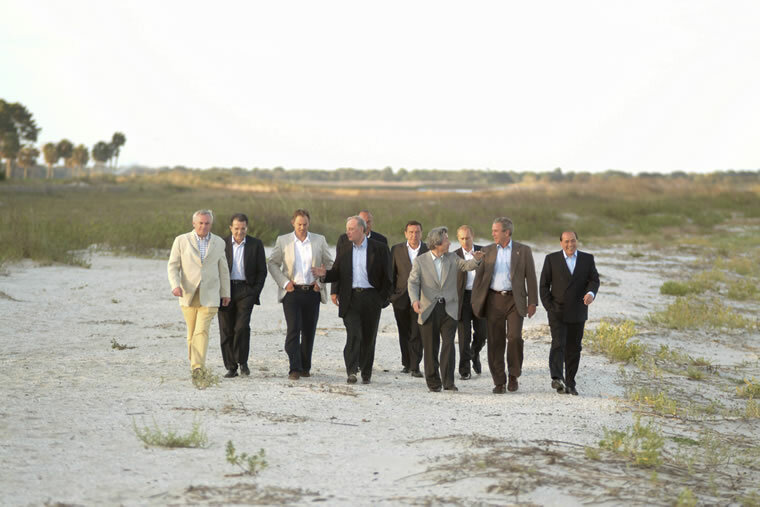 In 2004, Sea Island hosted the G8 Summit, the meeting of the largest industrial democracies. It remains the only resort in the U.S. to have done so, ultimately hosting 22 world leaders during that summer. The Sea Island staff had about a year to prepare for the event, which brought the delegates and their staffs, security and Secret Service to the Island, and drew worldwide media attention. Recently, Sea Island underwent an ownership change, being acquired by Denver’s Anschutz family. The acquisition, which consolidated ownership of Sea Island and the Colorado Springs, Colorado-based resort The Broadmoor, placed Sea Island in a 100-year family trust to preserve its historical and cultural value. At the same time, Sea Island returns to its roots as a family-owned organization, well-prepared to serve guests and members for another century to come. At Sea Island, preservation is not synonymous with stagnation. This year, the resort will complete a number of exciting enhancements at The Lodge, adding six new cottages, an oceanfront pool and pool house, an 18-hole putting course and a brand-new, state-of-the-art Golf Performance Center. The 17,000-square-foot Golf Performance Center will have a putting studio, full-service workshop, gym, retail area, club-fitting bays and all the industry-leading technology needed to enhance a golfer’s game, whether they are a novice or PGA pro. It is scheduled to be completed in early 2019, while the other additions are slated to be finished this November, in time for the RSM Classic, an official PGA TOUR event held annually at the resort. Another highly anticipated development: The Plantation Course will undergo a full renovation under the direction of Love Golf Design, a golf course architecture firm founded by Sea Island’s own Davis Love III and his brother, Mark, reopening in October 2019. The renovation will evoke the history of the course, creating new and interesting strategic elements while retaining the course’s character and routing. In addition to pursuing physical enhancements, Sea Island remains dedicated to the tradition of providing the utmost in experiences and special events that foster the resort’s community atmosphere. For instance, to celebrate the 90th anniversary, Sea Island is running a contest in which guests and members are encouraged to share memories and stories involving the resort. A lucky winner will enjoy a “Sea Island experience” at his or her home. “You might have dinner prepared in your home by a Sea Island chef, for instance,” Tipton explains. Atlanta’s legendary eatery, The Varsity, also celebrates its 90th anniversary this year, creating a fun opportunity for collaborating. In March, Sea Island Club members enjoyed a party complemented by food from The Varsity’s iconic red-and-white truck, complete with its friendly staff’s signature “What’ll ya have?” echoing across Rainbow Island. These are just a few of the major moments that shaped the resort’s 90-year history. Designed by renowned architect Addison Mizner, Sea Island’s 46-room “friendly little hotel” opens its doors and immediately becomes a popular vacation destination. When President Calvin Coolidge visits for the holidays, the publicity truly puts Sea Island on the map. The resort survives the economic crisis thanks to tenacity, ingenuity and community support, and turns its first profit. The resort undergoes numerous enhancements, including the addition of conference facilities and accommodations, and the creation of The Cloister’s Junior Staff program. Adding to the resort’s accolades, Harper’s Bazaar names Sea Island among the 10 best resorts in the world. A dream of Davis Love Jr., the Golf Learning Center becomes a reality and quickly catches the attention of professional golfers and fans alike. The Lodge opens, becomes a hub for golfers and wins the AAA Five-Diamond Award in its first year, followed by the Forbes Five-Star award in 2002. The resort’s reputation for impeccable service, and experience in providing privacy and security leads President George W. Bush to select Sea Island as the site of the 2004 gathering of world leaders. Sea Island unveils The Cloister’s new main building, adeptly designed keeping Mizner’s aesthetic intact. In addition, a new 65,000-square-foot spa opens, and the new Sea Island Beach Club makes its debut the following year. Hosted by Davis Love III, The RSM Classic—then known as the McGladrey Classic—becomes a new PGA TOUR event that attracts golf professionals and fans from around the world to the Seaside course at the resort. Following the additions of a new adults-only pool and the elegant Mizner Ballroom, Sea Island adds 63 rooms to The Cloister with the Garden Wing. The Anschutz family, who also owns The Broadmoor in Colorado Springs, Colorado, purchases Sea Island, marking a return to family stewardship and commitment. Sea Island becomes the only resort in the world to achieve four Forbes Five-Stars—for The Cloister, the Georgian Room, The Lodge and The Spa at Sea Island and Fitness Center—10 years in a row.